We know Warsaw very well and we love this city, and we are glad to share our knowledge and passion. Each visitor has their own preferences and interests, which is why we adapt our programmes to our guests’ needs. We can organize a tour around the Jewish parts of Warsaw, Warsaw craftsmen tour or a traditional city walk. Sky is the limit! Below you will find just a few of our suggestions. Do not linger! Contact us and we will prepare a tour especially for you! Immerse yourself in a crazy journey back in time in a genuine classic Nysa 522! You will see the unknown nooks and corners of the pre-war Warsaw, relicts from the times of the People’s Republic of Poland (PRL) and the local atmosphere of the Praga district. From tenement houses with bullet holes and shrines hidden in backyards, through the new face of the socialist city, all the way to the contemporary look of the Polish capital city. 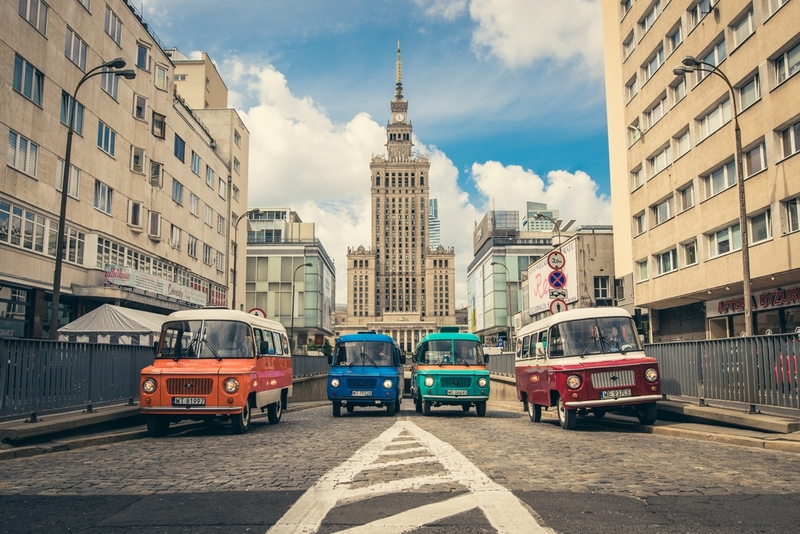 This tour will help you understand what kind of a city Warsaw is today. The non-formal atmosphere of a small group in our Nysa van will let you integrate better and enjoy a direct contact with your tour guide. On top of that we will stop in the best milk bar for a typical Polish lunch and at the end we will visit the “Charm of the PRL” Museum to understand the reality of the bygone era of communism. Take a completely different look upon Warsaw! You will get surprised by Constitution Square, discover the utopian plans of the Ministry of Agriculture, feel the propaganda at the Palace of Culture and Science (PKiN), and learn about the unknown secrets of the former headquarters of the Central Committee of the Polish United Workers’ Party (i.e. the Party House). We will take you to the Museum of Life under Communism (“Charm of the PRL” Museum) where to the sound of an old vinyl playing you will go back in time to understand the reality of the communist regime. You will have a chance to watch some propaganda films while enjoying a traditional drink and snack. From the top terrace of the Palace of Culture and Science you can see the mix of different kinds of the architecture that is a perfect background to understand this city. We will discover Downtown where you can see streets that survived the World War II. You can still find bullet holes from the Warsaw Uprising and feel the atmosphere of the old city. Next step we move to the communist world to show you the post-war ideas. You will see the way in which the communists rebuilt the city with a huge doze of propaganda. There will be time to see traditional tourist places – the Royal Route and the Old Town. We visit the most historical squares in Warsaw: Piłsudskiego, Teatralny, Bankowy. We stop by the Castle Square and go to the Old Town Square to see amazing streets. We go back by the Medieval Walls from Barbican. The last part of the tour is modern and green Warsaw in Powiśle area. Here you can see the best of modern architecture: Copernicus Center of Science, Świętokrzyski Bridge and Warsaw University Library- here we go on the roof garden to have an amazing view of Warsaw. We will visit Grzybowski Square where you will see the last street of the Jewish Ghetto and the Nożyk Synagogue, the only one to survive the war. After that we will see to the preserved part of the Ghetto wall, from where we will move on to the place of the former footbridge at the junction of Chłodna and Żelazna Streets, which used to connect the two Ghettos. Today, it is a place of great contrasts, an amazing mixture of different times. Then we will go to the recently opened POLIN Museum of the History of Polish Jews and see the Ghetto Heroes Monument, 18 Miła Street (the headquarters bunker of the Jewish Combat Organization (ŻOB) with its leader Mordechai Anielewicz) and Umschlagplatz. We will finish by walking down the former Nalewki Street to Bankowy Square where the largest synagogue in Warsaw used to be located. This tour is a mix of sightseeing and pub-crawling. With us you will see interesting places, beautifully lit at night. We will show you Warsaw from a more subjective perspective and look for places buzzing with nightlife. Together we get to see both trendy bars in the city centre, iconic pubs in Śródmieście and crazy, artistic places in the Praga district. At the end we will drive you safely to your hotel or a club of your preference. Experience the communist times of the People’s Republic of Poland (PRL). Travelling in a good old Nysa 522 van, we will see symbolic places, bars and everything that has preserved the spirit of the communist era until today. You will have some unusual tasks to deal with, such as using your ration cards to get meat in a local coffee place, making a speech like Władysław Gomułka, Polish communist leader, at the Tribune of Honour, or looking for a worker at Constitution Square. In the process you will experience a fair dose of absurdity of those times and warm up with a suitable drink. It is not a typical tour – we provide a combination of history and fun, spiced up with a dose of melancholy. See the Palace, a symbol of Warsaw, from the inside. It is a building of many secrets and exploring its multiple rooms feels like a trip back in time or even around Poland! Discover the history of the Palace which evokes extreme emotions even today. The tour ends with a panorama view of Warsaw from the Viewing Terrace “30. floor”. Guide will be like you private Angel! We can show you a lot of place in our beautiful city. You can choose where we will go. We are really flexible and creative! We are not afraid of challenges! We will prepare a special offer for you. Write us what you want to see and we will prepare the route. How to visit the city?